Is there anything better than a weekend at the beach? We were the lucky-ducky guests of friends who had rented a house that came with an extra bungalow to share. Steps from the water, the house was cute and had a roomy and well-appointed kitchen — perfect for cooking for friends. Each night, we were invited to share in the feast prepared by our lovely hosts. The wife is not only an amazing cook, but a superwoman who runs her own business and able to balance three young kids and two housefuls of guests with a great humor and style. Her tuna tartare was a dream: fresh tuna, avocado, sesame oil, wasabi powder, soy, and a lot of love. Juicy and thick hamburgers on a charcoal grill for lunch the next day. Fresh shrimp and clams steamed in beer with home-made cocktail sauce and melted compound butter for dinner. How could we not be inspired? This recipe is actually from Giada DeLaurentis, but since I had to make it from memory, the dish that I produced varied quite a bit. I give you the actual recipe below, followed by my variation at the end. 1. Season the steak with salt and freshly ground black pepper, herbs de Provence, and minced garlic. In a skillet, heat 3 tablespoons olive oil over medium heat. Sear the steak for a 7 minutes per side. Remove the meat from the pan and let it rest for 5 minutes. Thinly slice the steak. Set aside. 2. Meanwhile, bring a large pot of salted water to a boil over high heat. Add the pasta and cook until tender but still firm to the bite, stirring occasionally, about 8 to 10 minutes. Drain pasta, reserving 1/4 cup of pasta water. 3. In a small bowl, whisk together the balsamic vinegar, Dijon mustard, 1/2 teaspoon salt, 1/2 teaspoon pepper, fresh herbs, and 3/4 cup olive oil. In a large bowl toss the pasta with half of the salad dressing and the reserved pasta water. Add the arugula and steak, more dressing, and season with salt and freshly ground black pepper, as needed. Toss, pack for the picnic, or serve. 1. Combine the salt, ground black pepper, herbs de Provence, and minced garlic with 3 tablespoons of olive oil. Smear the mixture on both sides of the steak. Broil the steak for a few minutes per side until it is on the rarer side of medium. Remove the meat from the broiler pan and let it rest for 5 minutes. Thinly slice the steak. Set aside. 3. In a small bowl, whisk together the meat juices from the pan, Dijon mustard, 1/2 teaspoon salt, 1/2 teaspoon pepper, lemon juice, and 3/4 cup olive oil. In a large bowl toss the pasta with half of the salad dressing and the reserved pasta water. 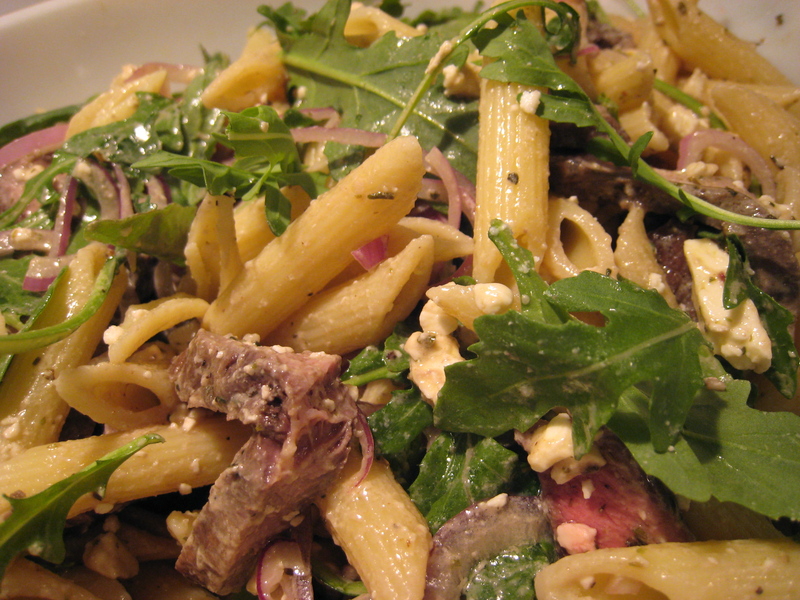 Add the arugula, red onions, feta, steak, more dressing, and season with salt and freshly ground black pepper, as needed. Toss, pack for the picnic, or serve.